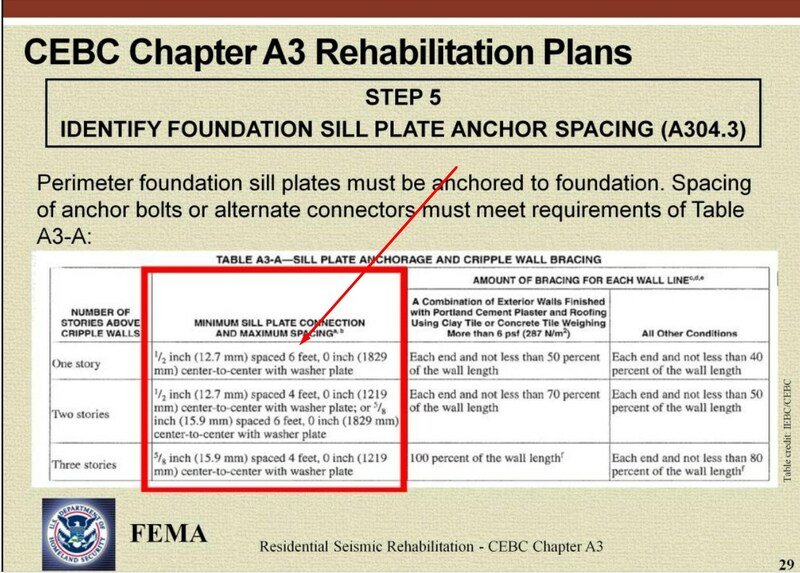 Appendix Chapter A3 of the 2016 California Existing Building Code (CEBC) is an outdated retrofit standard which is close to 50 years old. It recommends hardware that has not existed for 17 years and contains methods contradictory to the latest research in seismic retrofit design. Local governments also deemed Appendix Chapter A3 to be inadequate and replaced it with a new guideline called Standard Plan A. 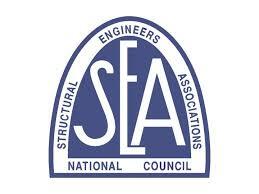 Standard Plan A has a lot of problems but provides a much superior retrofit. Sheathing is another name for plywood. An 8d common nail is simply a type of nail. They want the nails to be 4 inches apart on the edges. 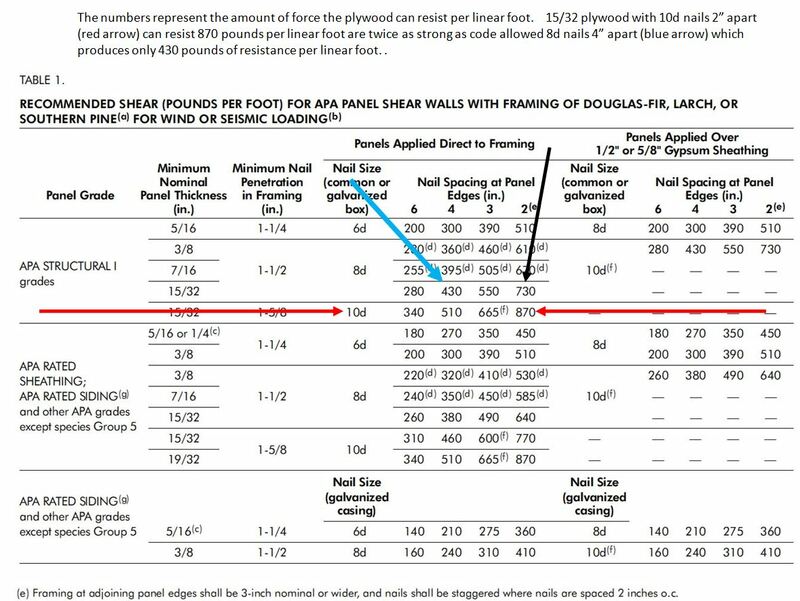 Plywood nailed 4″ apart will create a shear wall that has 430 pounds of resistance per linear foot. 10d common nails 2 inches apart can be used just as well for a resistance of 870 pounds per linear foot. Using these nails and a 2″ nailing pattern provides a significantly stronger shear wall. Using this 4″ apart nailing is also one of the problems with Standard Plan A. Appendix Chapter A3 makes no distinction between 15/32 (1/2 inch) 3 ply plywood and 5 ply plywood. The City of Los Angeles downgraded 3 ply plywood after it tore apart in the Northridge earthquake. 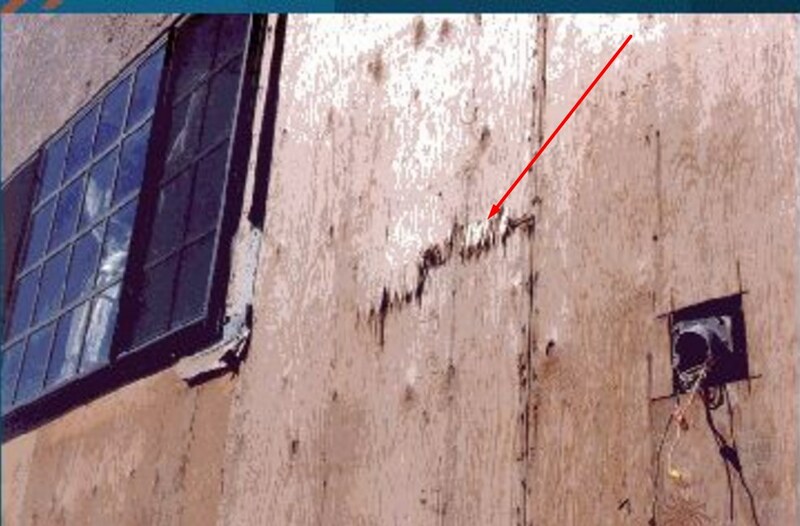 Using 3-ply plywood, still permitted by the Appendix Chapter A3 system, would produce a seismic retrofit only half as strong. The Los Angeles Building Code states that 5-ply structural 1 plywood can resist up to 870 pounds per linear foot. On a one-story house that is 25 feet wide by 60 feet long, 12.5 linear feet of plywood will be required on the front and back, and 30 linear feet on the two sides. Given the fact earthquake forces attack a house equally on all sides, this creates a retrofit that is out of balance, with the front and back significantly weaker than the 2 sides. If plywood was nailed at 870 pounds per linear foot, this house would be retrofitted with 12.5 feet of plywood on each side, be fully balanced, and twice as strong. 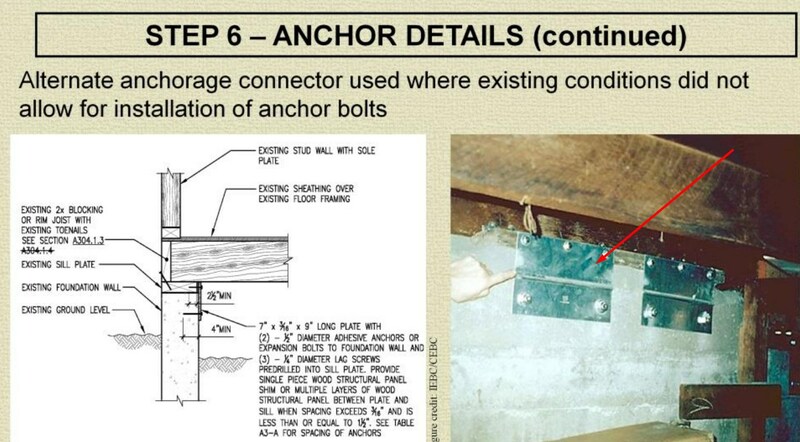 1-The CEBC mandates bolts be spaced 6 feet apart. This is irrational because the entire engineering community agrees only the bolts attached to the plywood do anything. The “New 2x Blocking” shown in the illustration is an expensive and unnecessary connection. Not only is it practically impossible to make, but elsewhere in the CEBC this table points out that making this connection is not necessary. Nor is it in any other retrofit standard. In other words, CEBC contradicts itself. This knocks out half of the houses we work on. The only difference between a house with cripple walls over 4 feet and under 4 feet is that when they are over 4 feet, overturning is a concern but is easily remedied with hold downs. This hardware made by Harlen Metal Products has not been in existence for almost 20 years. You can imagine the frustration of a contractor looking to use this hardware. 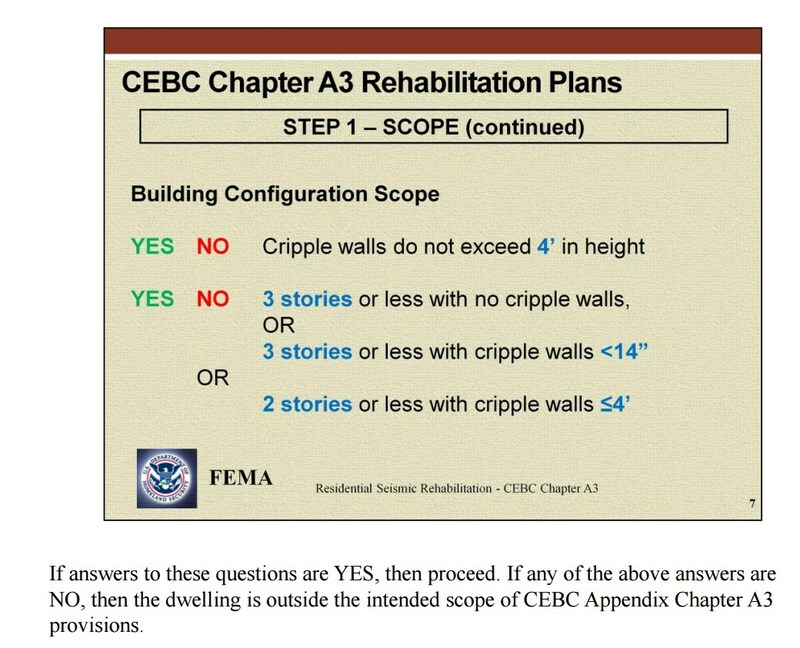 This shear wall detail recommends the untested Nailed Blocking Method as confirmed by the largest shear wall research lab in the world. All the engineers I have spoken with have no idea what this “Sheet Metal Framing Clip” is supposed to you. If you can figure it out, please let me know.